We’d love your help. 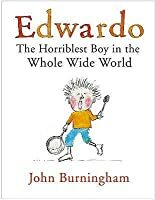 Let us know what’s wrong with this preview of Edwardo by John Burningham. To ask other readers questions about Edwardo, please sign up. This is a story about a typically-naughty, noisy, dirty little boy who lives down to every expectation voiced to him. He's told he's the noisiest, the dirtiest, the rudest, the wickedest little boy and so he becomes so. Through a series of fortuitious accidents, such as throwing his clothes out of the window instead of tidying his room and his clothes landing on a truck collecting clothes for charity, he gets a lot of praise and he lives up to that too. He eventually ends up the nicest little bo This is a story about a typically-naughty, noisy, dirty little boy who lives down to every expectation voiced to him. He's told he's the noisiest, the dirtiest, the rudest, the wickedest little boy and so he becomes so. Through a series of fortuitious accidents, such as throwing his clothes out of the window instead of tidying his room and his clothes landing on a truck collecting clothes for charity, he gets a lot of praise and he lives up to that too. He eventually ends up the nicest little boy in the world. Its a lovely book to read a child. All kiddies like to hear of children even naughtier than they are! But adults would do well to heed the lesson, children believe you when you say what you think they are and will live up to that - or down. This is a delightfully universal story with an English flair about the power of language. What we say does matter, and it shapes the reality of those around us, especially the young and impressionable. Whenever Edwardo does something wrong, adults employ hyperbole to tell him how awful he is. And so he becomes. Until some other adults use different language to describe some of his happy accidents. He becomes normal/wonderful again. This book is great for showing children the impact of what we say to others. I would read this during a Key Stage One PSHE lesson and discuss with the children the importance of thinking before you speak. Edwardo is a very rebellious child who appears to enjoy causing havoc on his surroundings often resulting in being told off by the adults in his life. This does not affect his behavior and he simply carries on which would keep children very curious at this stage in the book because there appears to be no consequences for bad behavior. I like the book because it is very cleverly written and the twist in the second half of the book will allow children to look at things in a different light where they may have predicted harsh punishment for Edwardo. The book has repetition and easily recognizable words that children would associate with naughty behavior, so I would have this book suited for year one and year two classes. The pictures can display why Edwardo is being told off, adults can be seen pointing and showing frustration and this matches the words exactly so that children can associate actions and text. When the book changes tone the illustrations and language change also which is beneficial when showing children different ways to write in one story. The language becomes polite ‘Thank you so much, Edwardo’ and the once ‘horriblest boy in the whole wide world’ is pictured smiling and being helping once he receives positive reinforcements. The message is loud and clear for children to break down. I have given this book a four star rating because it has a story and the language chosen is appropriate for my selected age group. I would elect to have this read out loud as a carpet time story where the children can join in with the repetitive statements and animal noises. This story allows the reader to consider the impact of their language and how someone can grow their self-esteem based on people changing their wording. This is not to say Edwardo is always perfect, but the positivity allows him space to be himself, and grow in his personality, rather than falling into the persistent negative comments. Edwardo is persistently told he is behaving in a way the adults dislike and eventually is deemed to be the "the horriblest boy in the whole wide world". The separ This story allows the reader to consider the impact of their language and how someone can grow their self-esteem based on people changing their wording. This is not to say Edwardo is always perfect, but the positivity allows him space to be himself, and grow in his personality, rather than falling into the persistent negative comments. 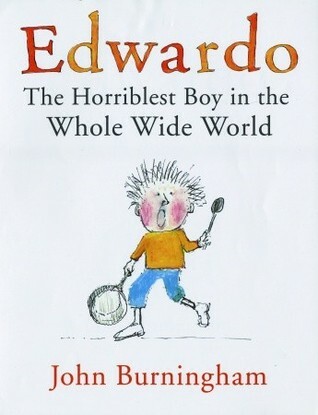 Edwardo is persistently told he is behaving in a way the adults dislike and eventually is deemed to be the "the horriblest boy in the whole wide world". The separation of the adults and Edwardo across the pages is quite striking in highlighting that the adults don't welcome how Edwardo is behaving. The next page Edwardo kicks a pot of flowers over, but another adult comments on Edwardo appearing to be growing a garden. Overtime over comments are made, which appear to allow Edwardo to have some confidence in himself and at the end he is deemed "the loveliest boy in the whole world wide." 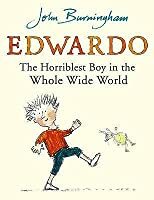 Edwardo was an ordinary boy, until people started being critical of the things he did, which only led to his increasing negative behavior, but once people starting noticing the good things he did on accident lead to positive compliments, and a well behaved Edwardo. This would appeal to lots of children who get told they are messy, dirty, etc. Edward becomes the loveliest boy which he was all along but people had to see it. A pretty good reminder of how important words are, and the dang of labeling others. "Like most children, Edwardo made a lot of noise. Edward became noisier and noisier." "Then one day, when Edwardo kicked a pot of flowers, it flew through the air and landed on some earth. Edward was good at growing things, and he was asked to help people with their gardens..."
This is an interesting read with lessons for kids and parents alike. Edwardo misbehaves, is messy and noisy and rude like other kids of a young age. However instead of being properly disciplined, he is just told over and over that he is the worst boy in the world and so he starts to believe it. But then things change. His bad behaviour backfires, seeing him doing good deeds, helping those around him and saving a life. Then he realizes he isn't that bad after all. Kids - it's expected that someti This is an interesting read with lessons for kids and parents alike. Edwardo misbehaves, is messy and noisy and rude like other kids of a young age. However instead of being properly disciplined, he is just told over and over that he is the worst boy in the world and so he starts to believe it. But then things change. His bad behaviour backfires, seeing him doing good deeds, helping those around him and saving a life. Then he realizes he isn't that bad after all. Kids - it's expected that sometimes you will be noisy or messy and us parents aren't always terribly happy with the results. Fantastic book about positive encouragement. Edwardo is a normal boy, and like normal boys he sometimes acts up....kicking things, chasing things, etc. All the grown-ups tell him he is the Horriblest boy in the WORLD! until one day when he kicks a pot of flowers and it lands in some dirt, and a kind grown-up sees him starting a garden...so then, Edwardo becomes good at gardening...and so on, until Edwardo is the nicest boy in the whole world. I love love love John Burningham's illustrations, they Fantastic book about positive encouragement. I love love love John Burningham's illustrations, they have such a great energy and humor, all scribbly and scratchy and sketchy...he must have been a bit like Edwardo himself! side note: did you know that John Burningham is married to children's author/illustrator Helen Oxenbury? Edwardo lives up to people's expectations. Edwardo is told he is the roughest, noisiest, nastiest, cruelest, messiest, clumsiest, dirtiest, most rude boy in the whole wide world. As you can see, one criticism leads to another in an exponential fashion and there he is--just what everybody said. Then, one day everything changed. He was doing one of his outrageous tricks when something good accidently happened, someone saw it and commented about it. So he did more of that one good thing and everybo Edwardo lives up to people's expectations. Edwardo is told he is the roughest, noisiest, nastiest, cruelest, messiest, clumsiest, dirtiest, most rude boy in the whole wide world. As you can see, one criticism leads to another in an exponential fashion and there he is--just what everybody said. Then, one day everything changed. He was doing one of his outrageous tricks when something good accidently happened, someone saw it and commented about it. So he did more of that one good thing and everybody noticed and praised him. One thing led to another and pretty soon he was the acclaimed "nicest boy in the whole wide world". I have a few of John Burninghams books, although I did not really enjoy this book as much as his other work. 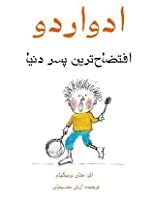 This book is a story about a young boy who isn't particularly nice to anybody and in return he also gets negative thoughts and comments about his appearance and attitude. Although this changed half way through the book where he became helpful and a more round nicer young boy. The white background of the book enabled the characters to stand out which draws the readers eye. But this wasn't a I have a few of John Burninghams books, although I did not really enjoy this book as much as his other work. This book is a story about a young boy who isn't particularly nice to anybody and in return he also gets negative thoughts and comments about his appearance and attitude. Although this changed half way through the book where he became helpful and a more round nicer young boy. This book illustrates my deeply held belief that the words you use with people determine in large part how they behave. If you tell a child he or she is rough, noisy, nasty, cruel, messy, or dirty, they will become more so. However, if you tell a child they are good at growing things, or good with animals, or generous, clean, smart, good with children, they truly will become the nicest children in the whole wide world! I like the concept of this book...but it's more for adults than children. It's wise advice for parents and others interacting with children to rephrase how we speak to young ones. They will see themselves as we see them....if we call them messy, or unkind...they will be so. I can't see myself reading this to a child or group of children, but I could see a principal reading it to his/her faculty and at an open school night for new parents. I have a new favorite author/illustrator, and his name is John Burningham. Although this isn't the book that made me fall in love with Burningham's work, this book is still very good in its own right. There is a quote that essentially says that how we talk to (our) children becomes there inner voice. Edwardo only ever heard how horrible he was until one day. And that one day changed everything. This book displays how others words can bring someone down and make them believe it. In a classroom, this would be a good introduction to discuss how we should be careful with what we say, we all make mistakes and learn from them, and how we should not let others tell us how we should Or should not be. This would be an example of civil practices to make children be aware of. Burningham uses watercolors, pencil sketches, and an ordinary boy to remind readers about the power of their words. We often forget about the impact that our words have on others, especially children; this book is a nice way to address the topic. An interesting exploration of how criticism of a child can lead to a self-fulfilling prophecy, but all it takes is someone to focus on the silver lining for that child to change for the better. A perfect example of reframing! Edwardo's behaviour gets worse the more he is criticised until someone mistakes his bad behaviour for a good deed. Nice moral to the story for the adult reading it and the story's pretty interesting for a child. This book is a story of a boy who transforms from the "horriblest" boy in the whole word to the nicest boy in the whole world. This story can show children the power of transformation and give them hope for transformation in their own lives and families. Oh. Oh oh oh. What we tell children becomes truth. This book is full of "sometimes" words like "occasionally," but it's also full of superlatives like "horriblest." Admittedly not a word, but a powerful message. This is a book I will read at the beginning of the year. Great because Edwardo becomes what people tell him he'll become: rude, dirty, cruel, etc. Then, quite by accident, Edwardo discovers that he can also become kind, responsible, clean, etc. In the end, he's nicest boy in the whole wide world. I think it is a good book for parents, teachers, nannies . . . basically anyone that takes care of a child. If you were told this over and over again you'd start to believe it was true. Makes me so sad. Poor Edwardo!! Edwardo is messy and an adult tells him he's the messiest kid in the word. So he becomes messier and messier. Repeat with rude, cruel, dirty, etc and we observe how kids live up to our expectations of them. There's a great lesson in this book for kids and caregivers alike. I really appreciated the reminder. We should all be mindful of what we say and how we act. Both have a bearing on the type of fruit that is produced in the lives of others. Every situation can turn into a teachable moment.